A flavorful spice rub or marinade is often what you need to turn grilled meat, fish or vegetables into your next go-to recipe. IT’S A RUB – A mixture of herbs, spices and seasonings applied to the surface of meats, poultry, fish and seafood helps form a desirable crust on the outside. Rubs can also be applied under the skin of chicken or turkey for additional flavor. A moist ingredient, such as oil, Worcestershire or mustard, can be added to create a wet rub. For more sophisticated rubs, start with whole spices for a deeper taste. 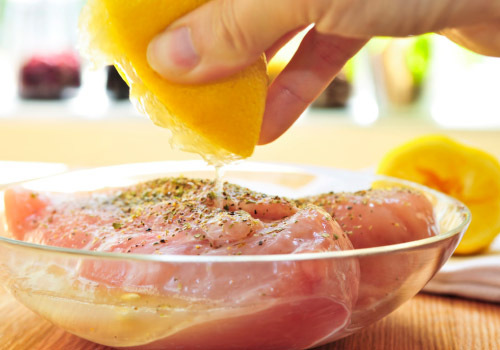 MARINATE ON THAT – Making a marinade to remember – that tenderizes and adds flavor – means finding new combinations of an acidic liquid, oil and herbs/spices. For beef and pork, plan on 1/4 cup of marinade per pound, and a bit less for poultry or fish. ACIDS – To tenderize, choose a wine, vinegar, fruit juice or combination of them to use for the acid. Anything goes that properly complements your fat and spice selections. OILS AND FATS – Oils help seal flavors into foods while keeping them moist. When selecting an oil, consider how strong of a flavor you want so you don’t overpower the seasonings. HERBS AND SPICES – From dried basil and citrus peel to paprika and grated ginger, herbs and spices will make your final product look and taste unique. SUGAR & HONEY – The addition of sugar or honey caramelizes and boosts browning, but don’t overdo it or your meat will burn.